and my dad talking about my mom. Have you ever written an obituary? I hadn’t until last night. It was hard. I wanted to go on and on and on and on about my mama. 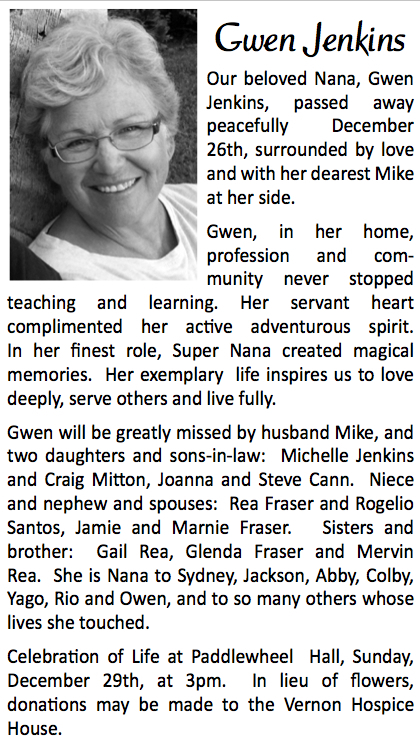 Our cousin, Marnie, had an amazing example of a beautiful obituary. My dad kept us succinct and focused. Rea had a way with words. Jamie slept on the couch. before we send it off to press. You did a great job. And yes I have written an obit. Tough but healing in a way. Sitting here in our living room thinking of all of you and Gwen. Hugs.